Welcome to my New England lighthouses and attractions home page at nelights.com! Dedicated to those who want to discover New England's lighthouses, and attractions within their surrounding coastal communities. I've had the opportunity to photograph all the nearly 170 lighthouses in New England, and am constantly researching and going back for better images. 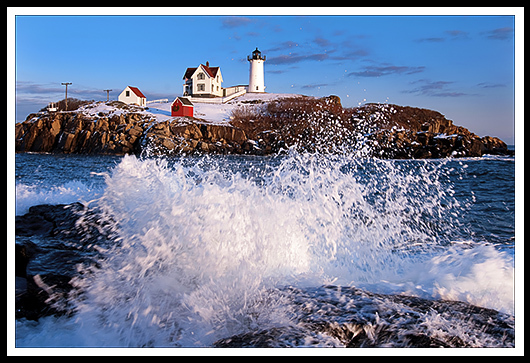 Tour my New England Lighthouse Galleries of photographs, which you can purchase at our professional lab as cards, photo prints, fine art archival gallery prints, or canvas wraps. For the lighthouse hunters, you'll find Directions and Cruises to all New England lighthouses that you want to drive, hike, or take a boat to explore. Also info on windjammer and other sailing cruises. In the Lighthouse Stories section, you'll find monthly tales of lighthouse history, shipwrecks, rescues, and even some haunted lighthouses. The Exploring Lighthouses section provides historic stories of each New England lighthouse, within regions, including boat tours and cruises, places to visit in each area, photo galleries, directions, and more. I have three lighthouse books, two lighthouse tourism books for southern and northern New England have just been released. Check them out! The About section provides contact info and special lighthouse info, lighthouse preservation organizations, and more. Check it out and make this your favorite guide to New England's lighthouses and local attractions.